Wadi Gad is a veteran drummer and recording artist who is in music business for over three decades. 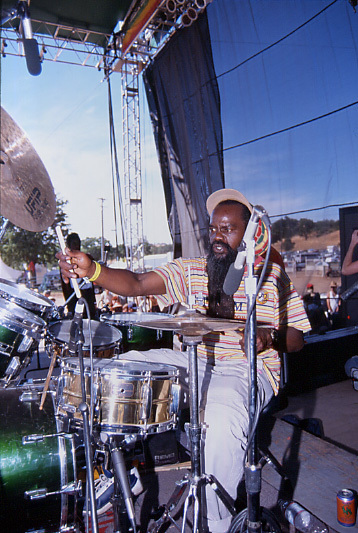 During his enduring career he has worked with many greats in reggae music as he has played drums for artists like Horace Andy, Abyssinians, Big Youth, U Roy, Mikey Dread, John Holt and Jimmy Riley, to name a few. The beginning of new millennium marked the start of a new chapter in Wadi Gad's musical life as he started focusing on a solo singing and songwriting career. His first efforts can be captured on Wadi Gad's first full length album "New Day", which is released on the independent record label "Ras Redemption Records". Accompanied by musicians like Tony Bird, Ralston Grant, Joseph I, Sonny Andrews and Lawrence Lewis, Wadi Gad delivers a decent roots reggae album with enough tunes worthwhile spinning more than once. Soulful harmonies, enjoyable horn lines and nyabinghi drumming as well as the original style and sound are the most remarkable ingredients of this well produced album. Furthermore "New Day" benefits from the mixing skills of the renown Scientist, who has done a good job. Wadi Gad delivers words of conscious wisdom rooted in the teachings of Rastafari and each song fully showcases that he is a gifted songwriter who doesn't lack lyrics. It makes that most of his songs keep you involved till the very end. Best tracks are "Jah Is My Desire", "Never Give Up", "Psalm 136 His Mercy", "Strength Of" and the title track "New Day"